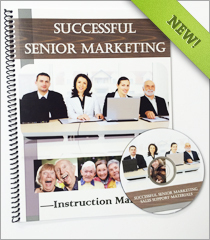 This 220 page Instruction Manual will help you market your services to aging seniors by teaching you numerous unique and highly effective marketing strategies. Examples of these strategies include collaborative marketing and worksite presentations for employers. This instruction manual will also teach you how to use the DVD which contains marketing materials to promote your services and the seminar marketing package. Chapter 1 introduces the system, highlights 6 of the more important marketing strategies in the system and explains the various ways how we, the National Care Planning Council, will assist you in your efforts to find new clients. Chapter 2 was written for the purpose of promoting your company and services to the community with marketing techniques that your competitors are likely not using. Chapter 3 introduces the powerful concept of organizing a group of like-minded individuals who provide service to seniors and their families. We call these groups local planning councils. Each council works in a community to offer direction and advice as well as a one-stop shopping service for seniors and their families. Organizing a group of like-minded individuals who provide a community service for the elderly and their families will open doors for marketing opportunities that any single member of the group could not open by themselves. Chapter 4 is devoted entirely to seminar marketing. We believe our seminar marketing package (contained in this system) is the most comprehensive set of presentations and ever made. Not only will we train you how to do seminar marketing successfully and educate you on the various subjects included in the seminar presentations, but we will give you a system that can be customized (using 175 mix-and-match slides) to provide presentations on 21 different aging senior issues and adapted for encounters of 30 minutes, 60 minutes 120 minutes or three hours. 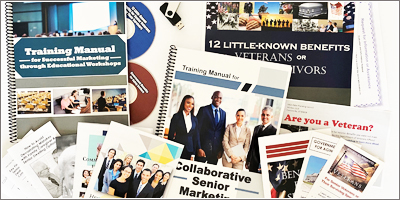 The seminar marketing package also includes materials for your constructing extremely high-quality workbooks on over 30 different presentation subjects. Our unique seminar marketing approach allows you to reach out to just about any audience and present on just about any subject you want. This seminar marketing package can be used to present to care facility residents and visitors, church groups, luncheons, associations, and worksites including your own office.